As they depart from and land in Hong Kong, people from all walks of life pass through the Hong Kong International Airport on a daily basis. The employees of Solar Airlines are the ones who are ultimately responsible in safely transporting these passengers to and from their destinations the moment they board their planes. While passengers only know them in the professional sense, each of these Solar employees have their own unique stories that goes beyond the airport’s doors. Triumph in the Skies, we meet again. I distinctly remember watching it when TVB dramas were still recorded on VHS tapes, and I had to sort through the pile of tapes to find the next set of episodes. Everything about this drama, from the story, actors, to the mere process of watching it, is a wistful nod to the simpler, olden days where a completely fake-looking CGI airplane flying through the clouds was impressive stuff. 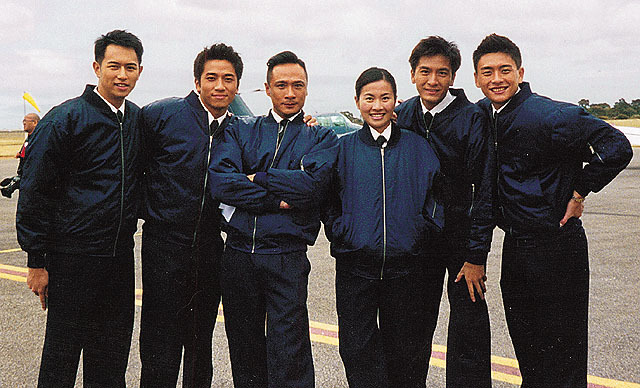 Triumph in the Skies was once my favorite TVB drama because it was like nothing I’d ever watched before, but in the years since, it’s been cast aside in favor of more dramatic and popular dramas. But in thinking about this drama for Throwback Thursday, I’m once again reminded of why it was so successful and beloved. Triumph in the Skies had the unique ability in making its audience member feel the simple and pure human emotions from the story and its characters, which makes the fiction seem real. It’s been a long time since I’ve watched Triumph (9 years, maybe? ), so many of the small plot details have been forgotten. What I do remember, however, is how the entire story felt so refreshing. It’s kind of strange to describe a TVB occupation drama as that because I’m pretty sure the network has made a drama for every occupation out there. One of the main reasons why I usually avoid occupation dramas nowadays is because of how boring and technical they can sometimes be. But for a drama that constantly dealt with flight routes and airplane equipment, it never felt like you’re in a lecture hall being taught how to fly an airplane. The ability to balance out the “boring” technical parts of all occupation dramas with the dramatic plot and fun of a regular ol’ drama really helped Triumph become the classic that it is. 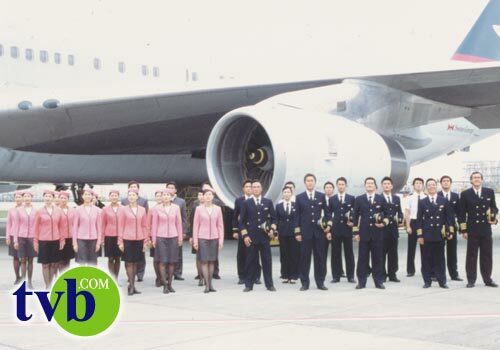 At the time, it truly was a novel idea to do a drama featuring pilots, flight attendants, and airport employees. There are plenty of cop and lawyer dramas, but how many pilot ones are there? Exactly. Triumph appealed to audience members because it was something that almost none of us had seen before, so it was naturally surrounded by intrigue and newness. And as they say, new is always better. (Most of the time, anyways.) The profession also translated extremely well onscreen because it allowed for the show to have anecdotal stories every few episodes as we meet new characters traveling on Solar Airlines. Although this is long drama, by TVB standards, it never felt like it was dragging along. There were enough characters in Triumph who had their own storylines that there’s plenty of drama to go around. While the main story is ultimately about the love triangle between Sam, Vincent and Belle, I was just as interested in the other storylines as I was with theirs. There was just so much going on in the drama that you’re never bored or frustrated by the lack of development. Okay, I will admit that most of the plot happens at a slower place than your typical melodrama or even police show, but I wouldn’t consider it be a flaw of the drama. There are also plenty of expected moments that are found in almost any type of occupation drama, but still with enough slight twists and turns that offset the predictability. Another reason that I think Triumph remains to be such a beloved drama is because of the cast. I don’t think I fully appreciated the cast when I first watched the drama because I didn’t know half of the newbie actors. Of course, nowadays those “newbie” actors are the reigning lead actors and actresses of TVB. How fast time flies! Triumph probably featured the most impressive group of young actors ever in one drama: Ron, Bosco, Kenneth, Sammul, Myolie, Nancy. Throw in Raymond Lam and Linda Chung and you’ve got yourself a dream cast. Even as I watch these actors now, I still think back to their breakout roles in Triumph and how new everyone’s acting was then. That was literally the first time I’d ever seen Ron, Bosco, and Kenneth in a drama! Ah, nostalgia. Besides the group of young actors, Triumph also had a talented group of veteran actors. Francis Ng and Flora Chan aren’t my favorite actors or anything, but I have to admit that they played their respective roles extremely well. Even when she was married to Joe Ma in the drama, I was sometimes disappointed that she hadn’t chosen Francis because their onscreen chemistry was that good. Joe Ma was also great in his role, and I think he could have given Chilam a run for his money in the “flirty pilot” role. I think TVB did an excellent job in choosing which actors to play which role in Triumph because it did seem like they were made to play these roles. Like how I always think back to the younger generation’s breakout roles in Triumph, I always associate these veteran actors with their characters in this drama. I loved Triumph when it first came out, and I still do now. I haven’t watched it in a long time, but every time I see it mentioned or hear Eason Chan’s iconic theme song, I’m transported to those olden days of TVB on VHS and Ron Ng as a rookie actor. When the sequel, Triumph in the Skies II, came out in 2013, I debated whether or not I wanted to watch it. I ultimately decided against it because my friend told me that it wasn’t as good as the first one, and that was enough to make me skip the sequel. Despite that, I’m extremely excited for the movie version of the drama, especially with the additions of Louis Koo and Charmaine Sheh into the Triumph family! It’s been more than 11 years since the first Triumph in the Skies, but it will always remain near the top of my “Favorite Dramas” List. I associate this drama with what I consider to be TVB’s Golden Age (late ’90s to mid ‘oos), and think that it is truly a classic drama that all fans should watch. It’s a drama with a lot of heart and love, all in a setting that is unique to the drama scene. 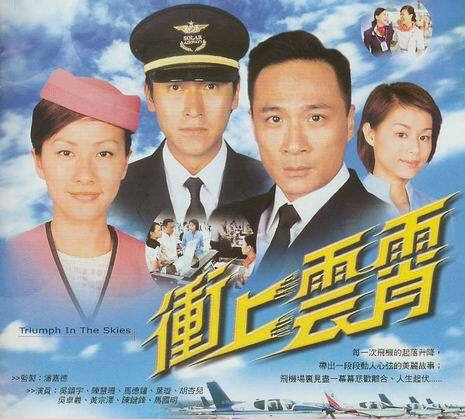 Whether you’ve been watching TVB dramas for years or have never seen one before, Triumph in the Skies is one that will not disappoint. The sequel, Triumph in the Skies II, aired in 2013 and won “Best Drama” at the 2013 TVB Anniversary Awards. The film version (same name) of the Triumph series is set to be released in theaters on February 19, 2015. Francis Ng and Julian “Chilam” Cheung will be reprising their roles as Sam Tong and Jayden Koo (Triumph II), respectively. The cast also features Louis Koo, Sammi Cheng, Charmaine Sheh, and Amber Kuo. This will be the first onscreen reunion between Louis and Charmaine in 16 years. Their last collaboration was the 1999 TVB drama, Detective Investigation Files IV (great drama!). The theme song, 歲月如歌/Like a Song, was performed by Eason Chan. It’s #2 on my Top 10 Favorite TVB Songs list! The fictional airlines in the drama, Solar Airlines, is subsequently seen in TVB dramas whenever someone is taking a flight. It was replaced by Skylette Airlines in the sequel. The Canto-pop girl group, Twins, guest starred in episode 6 of Triumph, and Eason Chan guest starred in episode 26. Ron and Sammul collaborated together for the 2005 TVB drama, The Academy, and it’s sequels, On the First Beat & Emergency Unit (E.U.) as Chung Lap Man and Lee Pak Kiu, respectively. Ron, Sammul, and Kenneth were reunited in the 2008 TVB drama, The Four. Raymond Lam was the 4th in the quartet. Triumph was Ron and Myolie’s first collaboration, but they’ve been in numerous productions together since then. They recently starred in the 2014 TVB drama, Lady Sour, as Cho Ching and Gai Tsun, respectively.